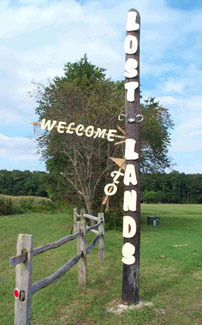 LOST LANDS celebrated its first season in 2001. We invite you to come visit Delaware’s newest, exclusively seasonal RV park in the Fenwick Island / Ocean City beach area. You will be “Glad You Found Us”. A limited number of seasonal sites become available each year. Be sure to reserve your site for the 2019 season before its too late. We are dedicated to providing a pleasurable camping experience for everyone. At LOST LANDS, we practice the “Golden Rule” of camping. We wish to thank those who have spent their summer seasons with us year after year. “Where Country meets the Beach” was derived from one of our most appealing features. 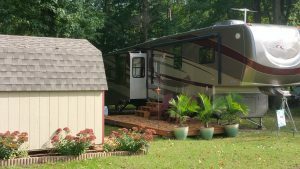 We are camping on farmland which is isolated, insulated, and surrounded by working farms, providing a quiet and secluded environment; yet we are only minutes from Fenwick Island and Ocean City. We take pride in the appearance of our campground and the community / neighborly atmosphere supported by our campers. Our campground is always neat and clean. You will find spacious sites with plenty of room for sheds, decks, and your favorite landscaping ornaments. The layout of the campsites also provides for optimal privacy while providing options for adjoining sites for close friends and family. We are large in overall size, yet small in numbers of sites. We also offer some of the largest sites available. The overall layout of the campground optimizes your privacy. We believe this combination fosters a feeling of “family” and satisfies that good ole Sussex County curiosity about “what’s your neighbor like”. We invite you to come join our community.